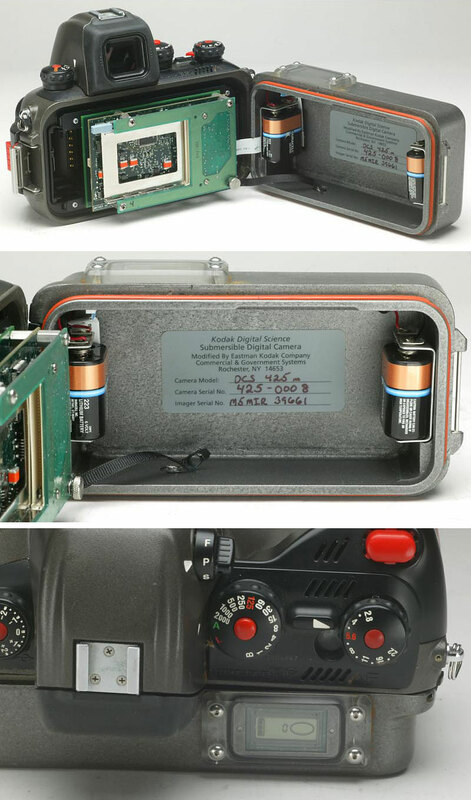 Until May 2005, the existence of a secret, digital Nikonos underwater camera was known only to a select few. 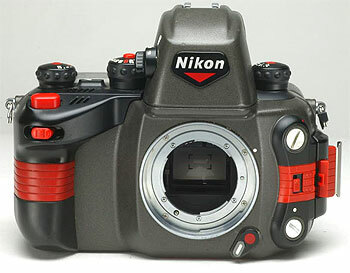 Then, a list of all Nikon based DCS cameras was posted in the vintage Kodak DSLR forum here on NikonWeb.com. Notice the cropped focusing screen reflected in the mirror in the photo on the right. Same frame as seen in other early DCS cameras. "I'm sorry but those cameras never existed here at Eastman Kodak. We never made cameras for that specific use. The information you have is incorrect." Strange, because I was certain the camera existed. Asking another Kodak source, I was told: "I think the issue is who they were made for". Over the next couple of years, I occasionally searched Google for new information about the mysterious Nikonos DCS models. As expected, I didn't find anything. But then, in December 2008, I got lucky. I found a post in a forum at wetpixel.com, an underwater photography web site, mentioning another post in a Spanish scuba forum. Only reason I found it: The English language post included some text written by yours truly, and copied from NikonWeb.com. It's a small world. Imagine my surprise when I clicked on the link and found no less than five high (relatively speaking) resolution photos of a Kodak DCS 425! I could hardly believe my eyes! Sounds like a monochrome sensor (? ), but according to the "official" list there's no such thing. Perhaps this is a third DCS 425 variant? (UPDATE: It IS a monochrome sensor. Read on for more information). According to the Spanish forum, the poster had bought the camera on eBay. No price or other information, except that the camera "doesn't work at the moment". Unfortunately, the original eBay listing was gone when I made my discovery. The message was posted in May 2008, and I believe that the camera was bought shortly before (because another forum member posted a link to the eBay listing). UPDATE: Since first publishing this article, I've been in touch with the current owner of the camera, a Spanish Nikonos collector. The DCS 425 is now part of his collection. The camera was bought on eBay in April 2008, from a US seller, for an undisclosed amount. I've also been able to locate the seller (i.e. the previous owner). He had also bought it on eBay, but then decided to sell it since the camera couldn't be fixed. US Navy SEAL with Kodak DCS 425 (click for larger version). US Navy photo by Ted Banks. Over at the wetpixel.com forum, not everyone was convinced. One forum member wrote: "It wouldn't surprise me if this existed, but honestly Nikonos would have released this in my mind if they had a working version back in 1996. The RS started being made in 1992 and then quietly just got stopped being made as digital came into being and the RS also went digital? The RS was never made after 1997 .. it just doesnt add up as a story to me." "980608-N-3236B-003 NAVAL AIR BASE CORONADO, California (June 8, 1998) -- Navy SEALs attached to SEAL Team One, Naval Air Base Coronado, CA, conducts training using the Nikon/Kodak DCS 425 underwater digital camera which can sends real time digital images to decision makers, and an LPI LPD tracking device uses brevity codes to send both mission status and precise longitude/latitude. U.S. Navy photo by Photographer's Mate 2nd Class Ted Banks. (RELEASED)"
What!? "..DCS 425 underwater digital camera which can send real time digital images..". Sounds too good to be true, and I'm sure it is. My guess is that this simply means that photos can be easily sent from the field, probably using a small laptop computer and a cell phone (or some other communication device). No way there's a built-in transmitter in this thing. (This was later confirmed by Jim McGarvey, Kodak's lead engineer on the DCS cameras. See additional info below). A digression: It's funny how many people think that the military has access to cutting edge sci-fi technology many, many years before the rest of the World. Sure, there are some pretty nifty gadgets out there, but you can rest assured that a hacked 1,5 megapixel camera like this doesn't include a built-in, high-tech satellite communication device! As seen in the photos, the camera back includes two Duracell 223 6V Lithium batteries. The digital part of the camera looks very simple: Three circuit boards, where the one closest to the shutter obviously holds the sensor. The outer board (i.e. the one closest to the hinged camera back) has a standard PCMCIA slot. It may look a bit "home made", but it still seems like an elegant solution. 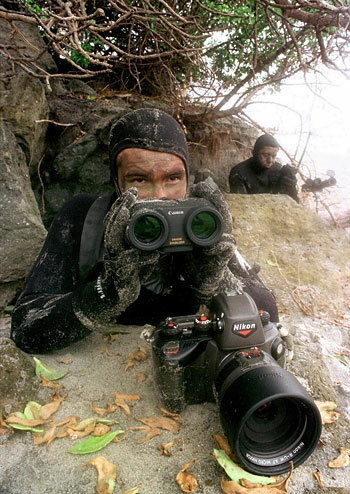 "The Nikonos body cameras were made by Kodak's Commercial & Government Systems division. Through most of the DCS years, that group would take our commercial camera designs and adapt them for government and other special needs. Some of that work was secret, but most of the products were simply only marketed in limited venues and didn't appear on the commerical photography radar screens. I don't think the Nikonos cameras were ever actually secret. Yes, the 425m was a monochrome camera, and that's one I missed on the model list. I have no idea how many Nikonos units were built, but I doubt the total would be over 100. They had no super secret special communications stuff, just standard DCS420 features." I don't know who took the DCS 425 photos on this page. They have been previously published on eBay at least once. I'll be glad to credit the photographer if he or she contacts me (webmaster at nikonweb dot com). However, since the material is made available for non-profit, educational and review purposes, I believe this constitutes fair use of the photos. US Navy SEAL photo by Ted Banks.